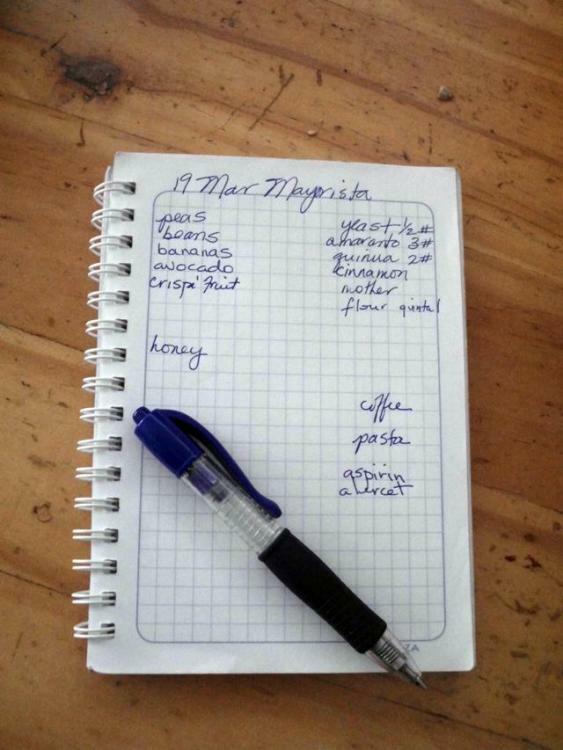 Wow, this is my third foodblog for the eGullet…. Welcome! I'll be with you from Palm Sunday through Holy Sunday to give you all a taste of the veritable food festival that is Easter in Ecuador. As usual, I intend to eat on the streets, visit a plethora of small shops and vendors, and talk about (and eat copious amounts of ) the specialty dishes of the holiday. A bit of background on me and where I am. I'm Elizabeth; I'm 33 years old and since the last foodblog I've ceased to be a Canadian expat in Ecuador, and become a full-fledged Ecuadorian citizen. 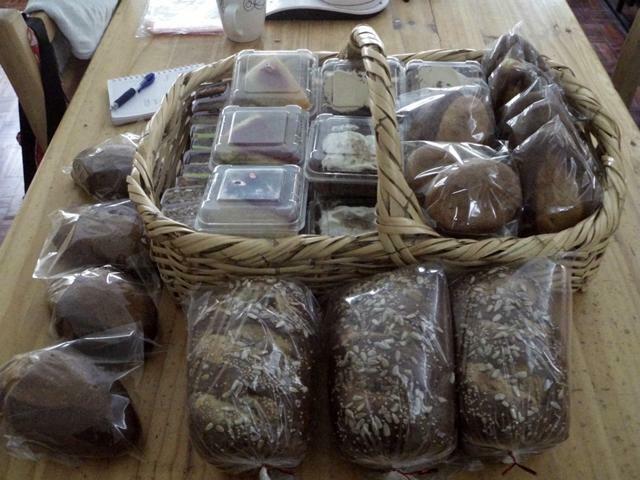 I run a catering bakery out of Ambato, and I deliver to clients on the entire mainland. 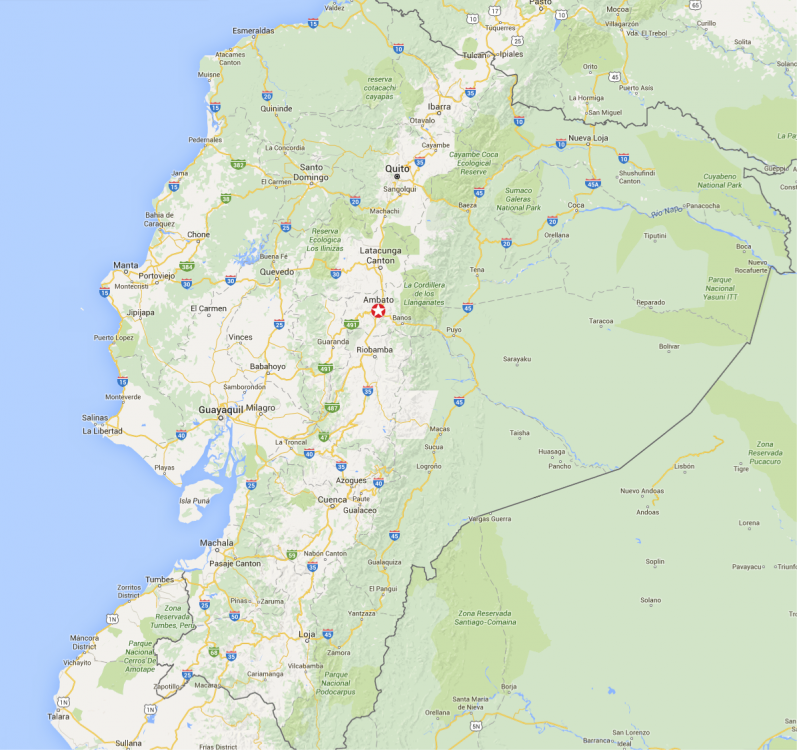 I've got a large customer base in nearby Baños de Agua Santa, a hot-springs town about an hour downslope of me to the east; I'll be visiting it on Wednesday with close to 100 kg of baked goods for delivery. 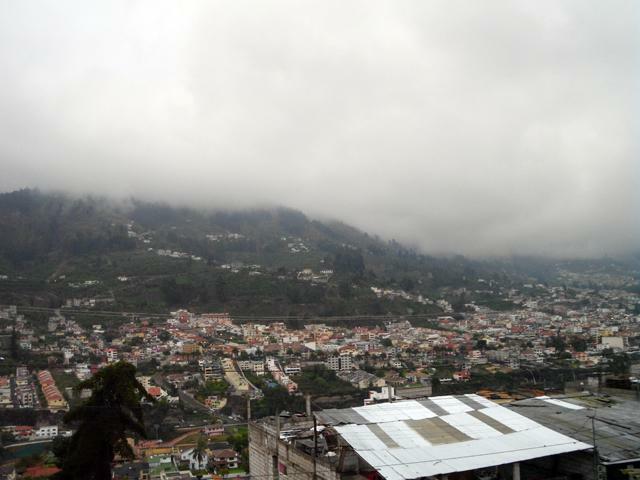 Ambato, the capital of Tungurahua province, is located almost exactly in the geographic centre of Ecuador. It's at an average elevation of 2,850 meters above sea level (slightly higher than Quito, the capital) - but this is measured in the downtown central park, which is significantly lower than most of the rest of the city, which extends up the sides of the river valley and onto the high plain above. We've got what amounts to eternal late springtime weather, with two well-marked rainy seasons. 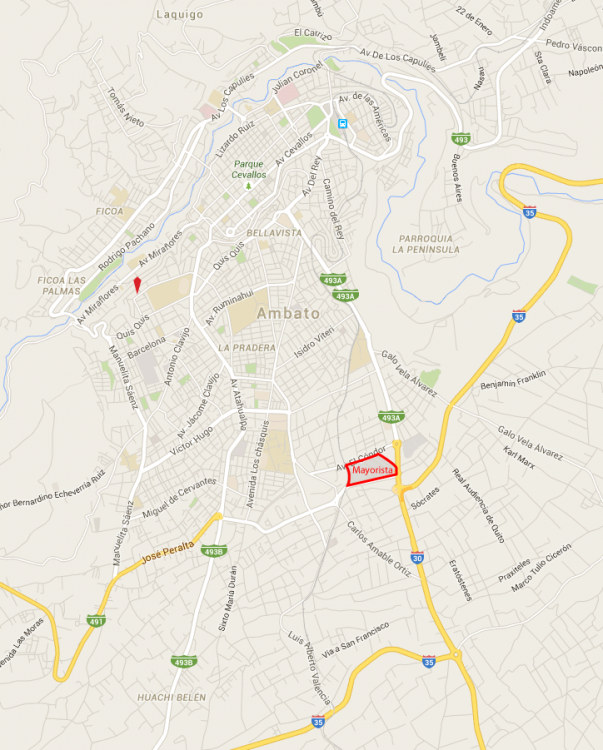 Ambato has about 300,000 people in its metro area; it's the fourth largest city in the country. 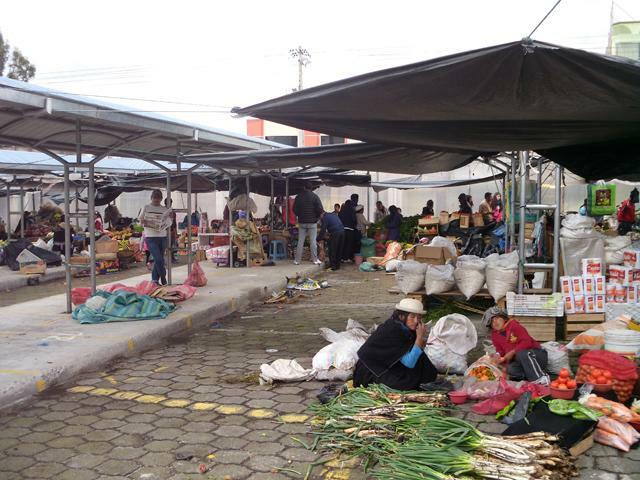 But maybe the most important thing about Ambato, especially to foodies, is that it's a transport hub for the country. 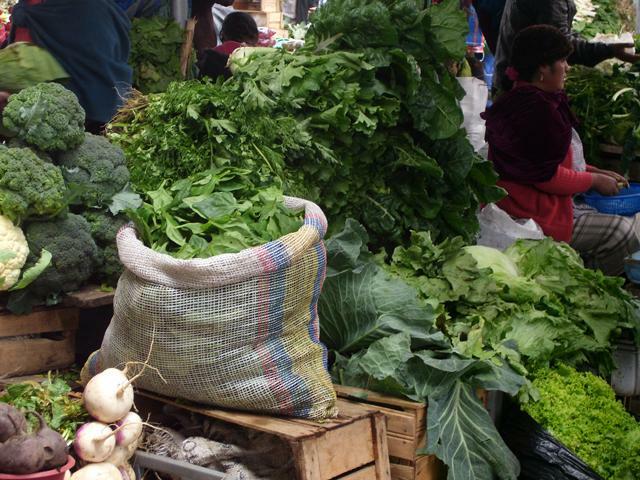 Anything travelling just about anywhere has to pass through Ambato on the way; it gives us the largest, best-stocked food market in South America. I have simply staggering variety at my fingertips. 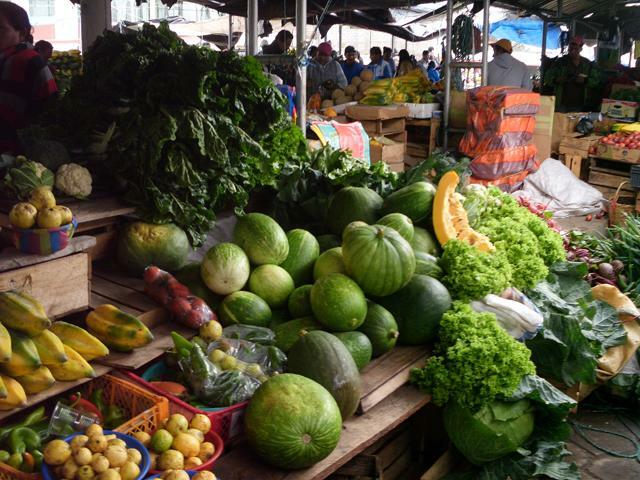 Today, I'll be doing my largest fresh-food shopping at the Mercado Mayorista, the largest market of its kind in South America - this place covers nearly 30 square blocks, and it exists to both buy and sell produce from across the country. Sundays and Mondays it also opens up to a huge, raucous farmer's market where smaller quantities are available for purchase. Sunday is the day of the freshest food and the largest number of vendors. And I'm going to cross more than half the city to get there - I've moved since the last blog, and my new house, on the slopes of the river valley is further away than the old one on the high plain. I promise to take many pictures of this - particularly close to the High Holy days, the Mayorista is alive with vendors and there will be special sections cordoned off for sales of bacalao, truly enormous squashes, and if it follows the previous years' trends, a festival of Hornado (about which more later). 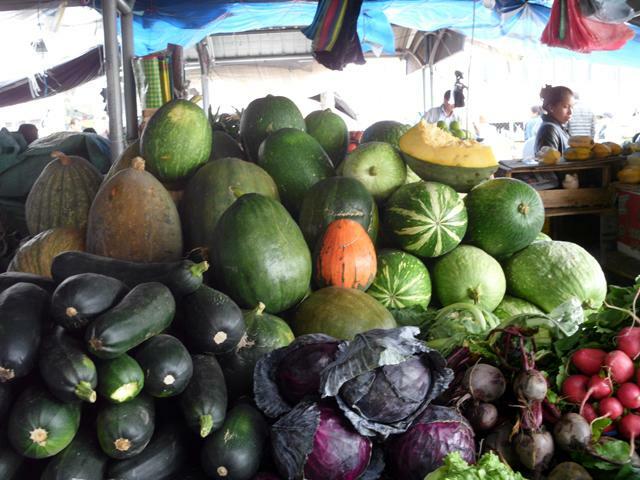 Apart from mangoes, which are just finishing up their season, it is harvest time across the country, and the Mayorista will be well stocked with all manner of fruits and vegetables. To start us off, I'll demystify one of my teasers a bit. 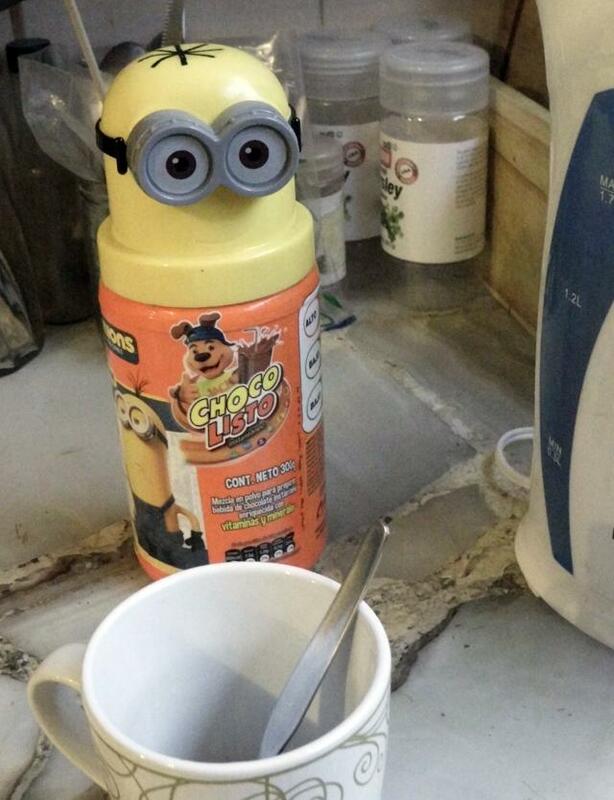 The Minion head that peeks out of my cupboard every day belongs to my jar of ChocoListo, the Ecuadorian equivalent of chocolate Ovaltine. Since I gave up coffee for Lent, it's my go-to morning beverage. ChocoListo normally comes in the plain white jar with orange lid that you see in front of the Minion; that's now my hot chocolate jar because I just couldn't resist when the company came out with the specialty jars. I firmly believe that one is never too old to have whimsical things! Hooray for PanaCan. If I EVER get to Ecuador...you can expect me at your door. I'd love to go there and to meet you and your family. (Don't worry...it's unlikely to happen...but then you never know.) This week will be fun with you. Greatly looking forward to this coming week! Thank you in advance for what I am certain will be a fascinating week. I really need at least a vicarious spring vacation right now and Ecuador sounds like the perfect place to 'visit', especially with you as our tour guide. Congratulations on becoming an Ecuadorian citizen, but you will always be a Canadian 'ex-pat' as well! We just can't let you go entirely and that easily! Can't wait. You always write about the most interesting things in the most interesting way. Shelby, I have only two words for you, and those words are "fig sandwiches." OK, so…. Lesson learned as to why not to give up coffee for Lent! Let's try this again, but on the right day. So, another cup of ChocoListo, and a brief diversion into why I'm drinking it rather than Milo, which is much closer to the "classic" Ovaltine of my youth. Milo is produced by Nestlé and despite being made in-country it's crushingly expensive - even a small tin, 250g, runs about $6 these days because, well, who can resist the Nestlé Overlords? Me, ooh, me, I can! 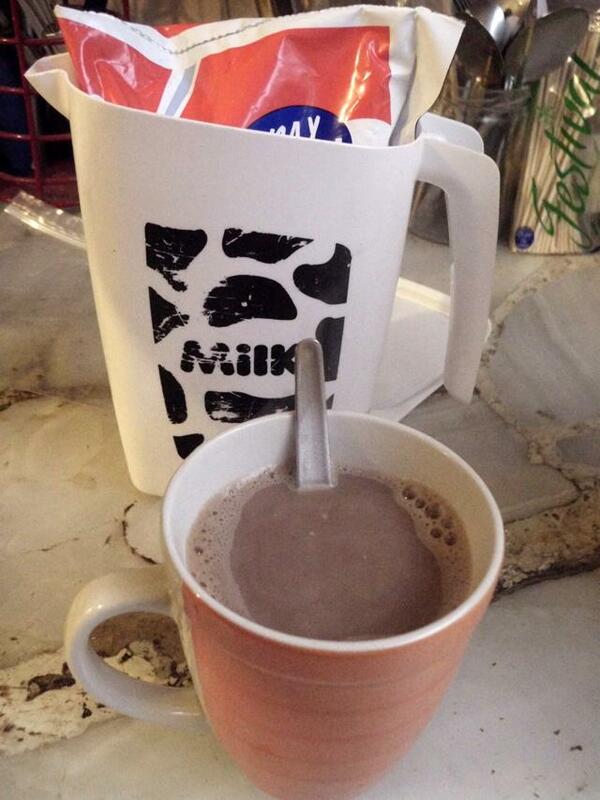 Resultantly, I drink ChocoListo, a product of the National Cocoa Corporation, which is about $2.50 for a 500g bag. I feel much better supporting a local company as well. Also, come on in my kitchen! 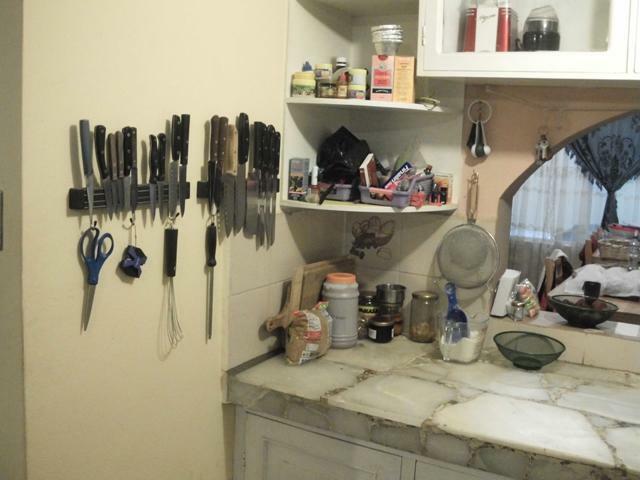 Back in 2012, with limited demand for my products, we shoehorned the baking production into what is best described as a Smurf-Kitchen - about 5 m2 with barely enough room for two people to work in it if both were good dancers. 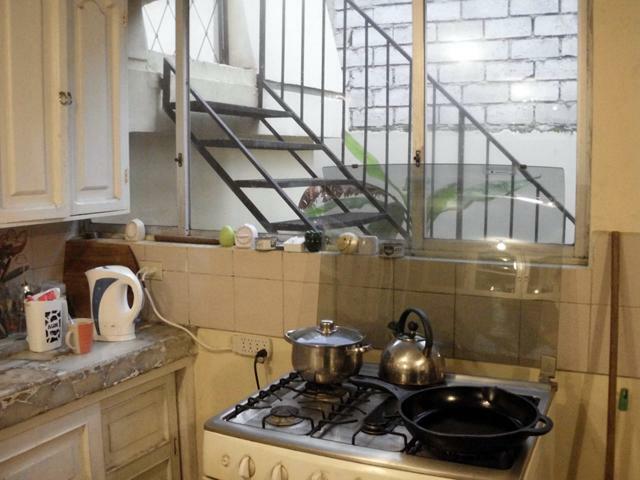 It had countertops geared towards average Ecuadorians, which is to say people who don't go over 150cm in height - with back-crushing results for 180cm me. In the intervening years, demand grew almost exponentially. The move to the valleyside, which happened late last year, came with a number of benefits, amongst them a huge kitchen space - about 20 m2 - that is a joy and, since it has tall counters designed for tall people, a comfort to work in. 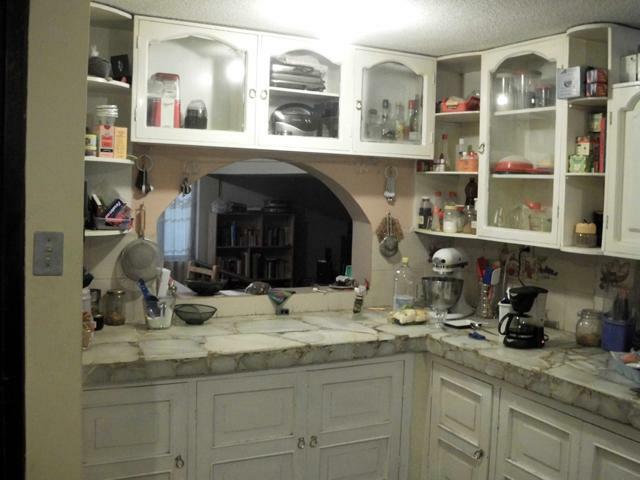 I'm so glad to have seen the last of those dratted low, blue tile countertops, you've got no clue dear readers. 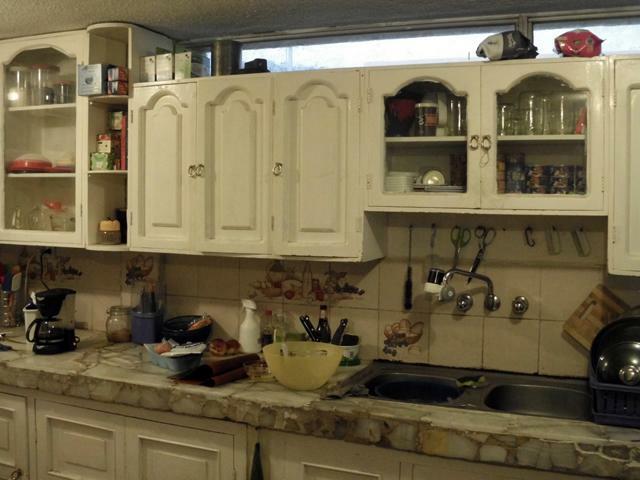 Please excuse the mess; the kitchen is in nearly 24 hour a day use so it's rarely pristine. You can see shades of my liquor cabinet here - about which more later. Not pictured: the other fridge, which exists to store dairy products and icings. The barrels upon which my eggs rest are large enough to hold half-quintal (roughly 25 kg or 50 lb, depending on the seller) sacks of sugar, flour, oats, rye, and more oats. 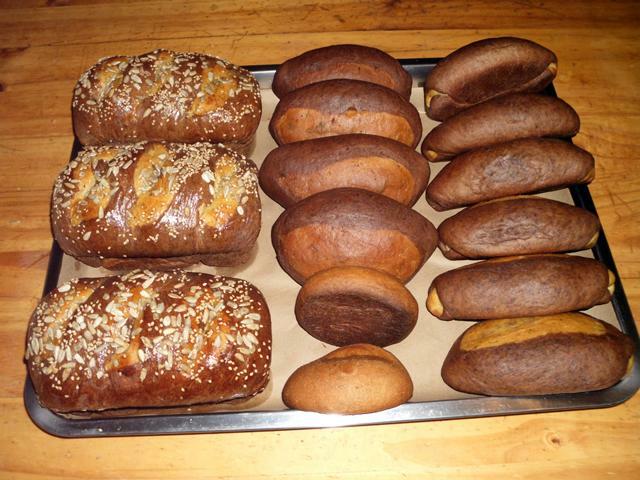 This morning's orders, for folks at the Mercado Mayorista, include loaves (both small, traditional Palanquetas and larger Western-style slicers) of Pan Injerto, and some wheat-free cornmeal buns for a celiac client. Do you do your commercial baking in that oven? PanaCan, I'd love to hear about how you handle making product for a celiac client while making wheat based products also... very excited to read this week! PanaCan, you are incredible. Nothing short of that! Yes I do. It's a domestic 6-burner range that runs on LPG, and has one rack in the oven. It's a real workhorse - I've had it for about 7 years now, and it's seen probably ten times the duty that the company intended. I've had to replace the tempered glass front door panel once, which the company acknowledges was an original design flaw (it exploded quite spectacularly about three years ago, for no apparent reason.) Apart from that, I make sure to clean out the verniers once a year - it's a very basic range, technologically speaking; there is very little that can go wrong with it. This is the same oven that you saw in the 2011 blog; it was nearly new then. I'm saving for a "proper" industrial gas convection oven, but even the most basic 4-rack model runs around $3,000 installed, and at the moment getting a locale to install it in is a higher priority - industrial oven installers won't put one in a domestic environment, as national safety standards dictate that industrial ovens need special venting and fire-brick surrounds. I have a separate set of cups, bowls, measuring spoons, pans, moulds, etc. which never see wheat; celiac orders are processed in a different sector of the kitchen (incidentally, the koshered section) to prevent cross-contamination. I don't serve anyone who's so sensitive to gluten that the mere presence of wheat in the environment will set them off - my wheat-free customers are in general either milder celiac or Crohn's cases, or have chosen to go gluten-free for other health reasons. 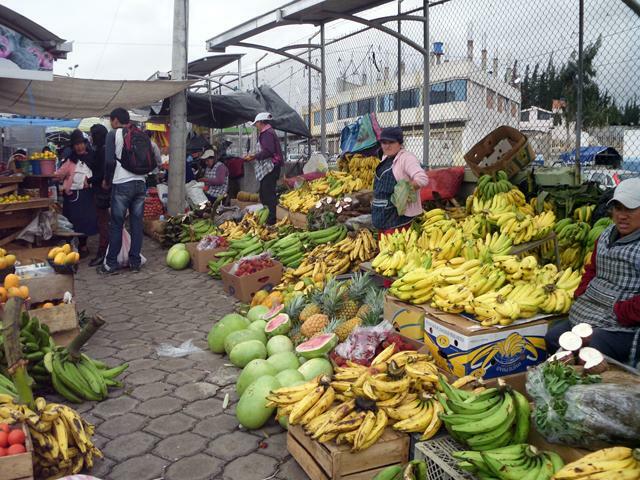 Ecuador is pretty interesting that way: our incidence of food-related allergies is staggeringly low when compared to other developing nations. Nut allergies are all but unheard of here, as are allergies to things like strawberries or shellfish. There is a correspondingly higher percentage of the population who have trouble with mango, but that's a very easy to spot and avoid allergen. As for gluten intolerance, it tends to be on the milder side and sufferers can often eat non-wheat sourced glutens such as oats or rye with no difficulty. The buns in question are based on a mixture of quinua, amaranth, and gold corn; I also make blue corn ones. Interesting. Wouldn't have thought there'd be a demand for this, and I'd love to hear more about it if you have the time. I recently saw a documentary about Ecuador called An Unknown Country, about Jews from Eastern Europe who escaped to Ecuador during WWII. It was one of the few countries that would take them. But it seemed that most of the population left after a generation or two. (Very good film, BTW.) And great blog. 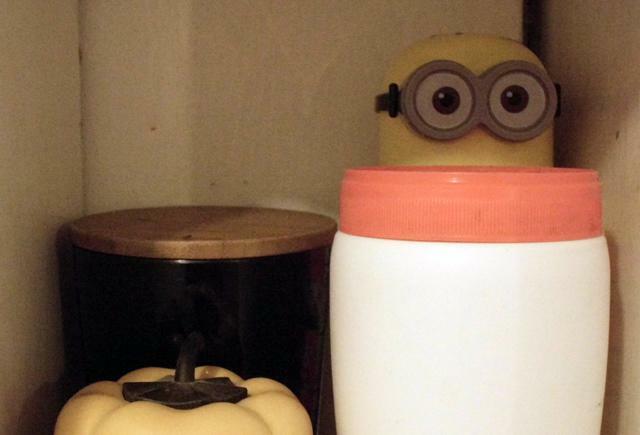 A wave of nostalgia for that plastic milk container! (They were prevalent in Israel when I lived there.) Looking forward to more. The staggeringly beautiful baked goods that come out of your kitchen, wow. I always assumed that you had multiple professional ovens, proofing boxes, many employees, etc (my American-centric background is betraying me here). I'm even more impressed after seeing your photos! Thank you for doing another blog! Glad to hear that you now have a bigger kitchen and countertops at the right height for you. 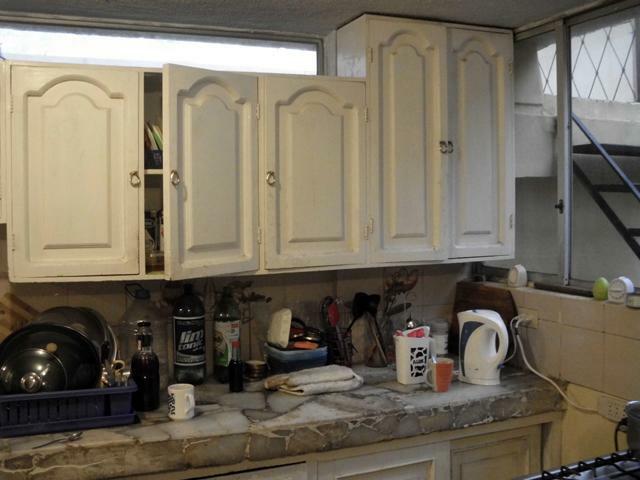 Those countertops look very interesting... are they a local stone? Not to interject too many social questions but are you still living with your parents or would it be ok for a single female to be living by herself in this part of Equador? So what fruits are in season now? 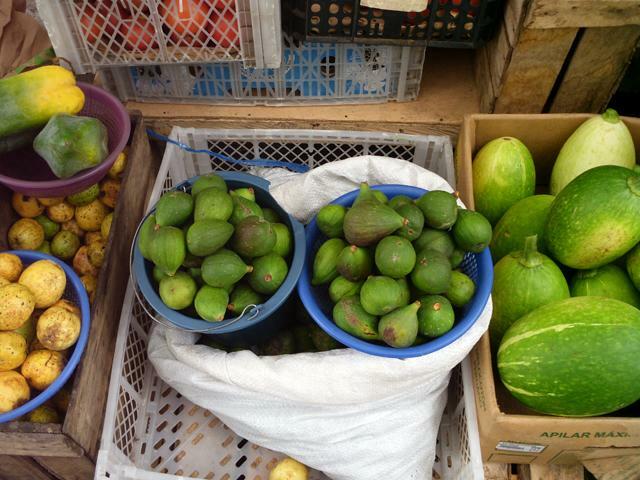 I heard you mention figs! I am really looking forward to your descriptions and photos of the markets (and any market stall food). the great people, especially Peru. Peru got a little too dangerous after that for travel. Ambato has a large enough permanent Jewish population to have a rabbi, a cantor, and a beautifully appointed temple. I may end up making hamentaschen for Moishe, the cantor, later this week - we'll see if he calls me. (He never calls, he never writes….) The community keeps me hopping around Pesach, because otherwise they're dependent on import matzoh which is expensive and can be hard to come by. I have a special toaster oven that has never seen yeast for this exact purpose. If you want an idea of what Ecuador is about, philosophically, all you have to do is come to Ambato on a day when religious festivities coincide. The Temple is next door to the Mosque, and across the street from a Catholic church. The largest arguments between these three traditionally antagonistic communities are over parking spaces - otherwise there's a simple sense of immense and kindly curiosity towards other peoples' religious choices. My customer base is about 75% locals and 25% expats (you'll get to meet some of the expats on Wednesday, when I visit Baños); this varies within the year, but it's the general way it shakes down. I started off with 100% locals - as I've mentioned in other foodblogs, my business started kind of by accident! 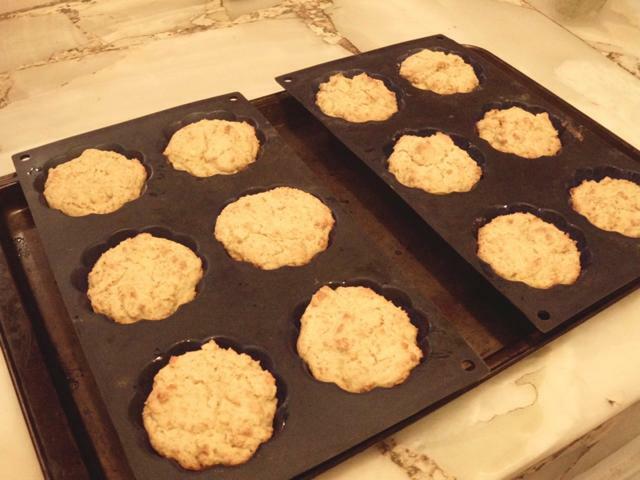 After about a year and a half of living here and eating crunchy biscuits, I started to miss classic, chewy oatmeal cookies - the kind every Canadian knows well, because every single one of our grandmothers makes them. So I went to the supermarket, got the ingredients, and made a batch or three, and then took some with me to a cafecito with friends who lived in the same apartment building. Those friends went crazy for the cookies! I started producing gift boxes of a dozen, and word of mouth started spreading. Seven years later, I have a fully fledged catering bakery. I have never advertised - my clientele comes almost exclusively by recommendation or by having tried my goodies. I did not speak more than 10 total words of Spanish before moving to a Spanish-speaking country. However, I had two things working for me: I did speak French, and I have a talent for learning languages if I'm truly immersed in them. We were taking care of a friend's house in the deep south of the country, where there was almost no English-speaking presence at all. Because I like to eat and eat well, I learned quickly - although I'm sure the market ladies found this tall blonde gringa with her horrible patois of Franglish asking "What's this? And you eat it how?" quite amusing. Finally, the choice was the culmination of quite a bit of research done by my folks as to where to retire. Mom's requirement was no more winter - summer and a rainy season would do quite well; stepdad's was a reasonably sane and stable government. Mine was affordability and work opportunities. Ecuador came out tops. We visited thinking to see Colombia, Ecuador, Peru, and Bolivia in the four months after Mom retired - it was our first vacation in about 22 years (my first vacation ever) and for reasons of flight availability and cost, we started with Ecuador. The country just reached out and grabbed our hearts - we spent 2 days in Colombia and 4 in Peru, liking each one less, and forgot Bolivia entirely. The return to Canada was only for the expedience of getting our documents together to emigrate, and to sell off our prior lives. My countertops are a laid aggregate of local volcanic quartz. Depending on the light in the kitchen they look anywhere from warm brown to pale pink; they're actually pale grey with chalcedonic banding. I love them to death - it's nearly impossible to damage a quartz countertop. Acid won't etch it, bases won't stain it, and it has all the properties that make stone such a pleasure to work on for pastry. I do still live with my parents; there is exactly zero social stigma for this choice, and there would be zero stigma if I chose to live apart from them (but why would I?) If I lived apart, I'd be expected to come home every Sunday for a big family meal (cafecito) if I lived in the same city, and on every possible holiday or long weekend if I lived in a different city. Ecuadorian culture puts great emphasis on family - they're your support network, your business connections, the first people you turn to if you're in difficulty. It's perfectly normal for an unmarried son or daughter to live with parents until after they're married, and contribute to that household like any other adult would. Once you pass 18 years of age it's kind of understood implicitly that you cease to be a child and become a roommate. Oh dear, what's in season now? I'm going to let my next entry, which is the market, speak to that one. Almost everything is the short answer. No need to go so far as Israel! 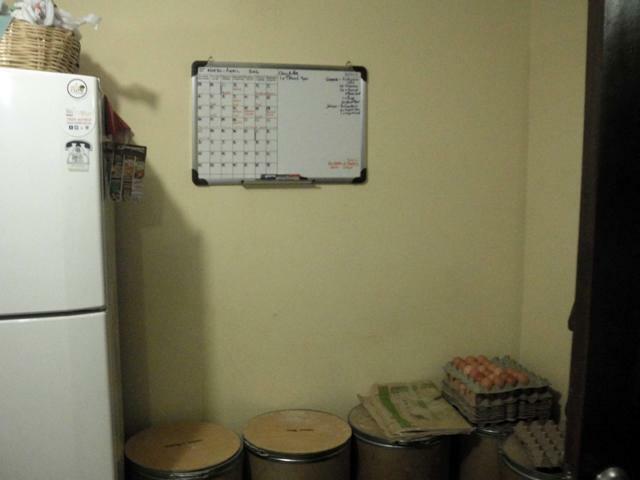 Those milk containers are fixtures in most homes in Canada. Can you tell us a little more about the breads you have pictured upthread, please. Sure! Those are a traditional style called Pan Injerto (literally, "Grafted Bread") where two types of bread are rolled together and baked. 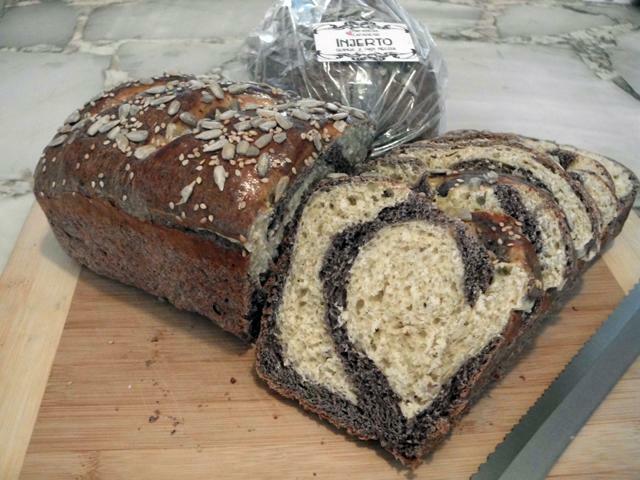 I do it a little differently than most Ambato bakers - a fully traditional Injerto is a white water bread grafted with a richer golden yolk bread; mine are enriched quinua herb (a whitish crumb) together with a black bread based on cornmeal, coffee, and chocolate. It comes out looking something like this when you slice it - depending on who's rolled it out, it's either a loose heart-spiral like this photo (my stepdad), or a much tighter spiral (myself). It is an ideal bread for sandwiches. The lightness and mild sweetness of the quinua bread balances the weight and bitter-sour tendency of the blue cornbread. Overall it's about 55% whole grains, 45% unbleached white at about 55% hydration (I'm not terribly scientific about it - when combining and kneading, I add flour until the dough "feels" right under my fingertips.) The doughs are takeoffs on my standby challah recipe - if you'd like, I can give you the general proportions of non-wheat to wheat flours and other adjuncts. 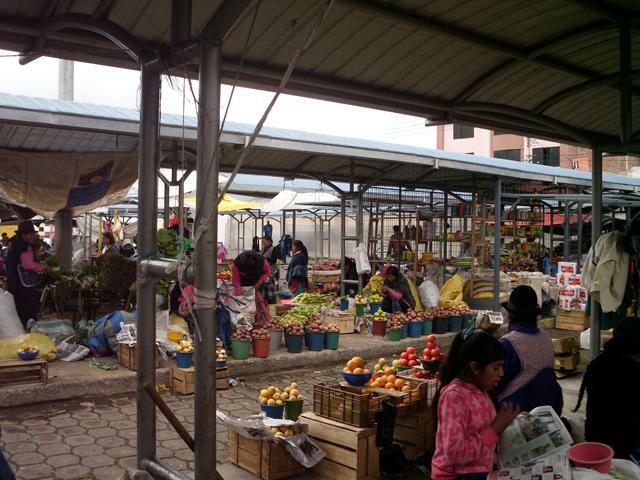 And this morning was the ever-changing and marvellous adventure that is the Ambato Mercado Mayorista! 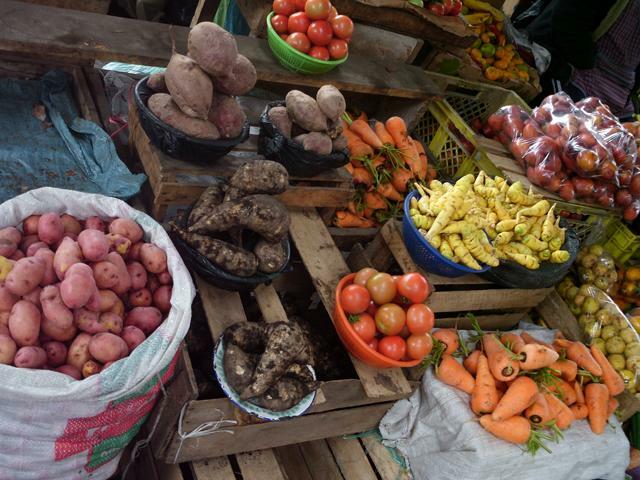 This is the country's, and indeed the continent's, largest fresh food market. It's laid out in sectors, and Google's satellite imagery was obviously taken on a sunny but deserted Saturday (the only day in the week when the Mayorista isn't in full operation.) I'll try to address it that way, too - it's kind of an overwhelming experience to shop here, even if you know what you're in for. The Mayorista opens at 5am on Sunday morning; I generally get there around 10am, once most of the vendors have arrived and set out their goods. I should also mention that when I go to the Mayorista, it's not purely as a purchaser - I'm also an ambulatory vendor. The basket generally looks kind of like this; I use the opportunity to sell off anything left from Friday's and Saturday's deliveries. 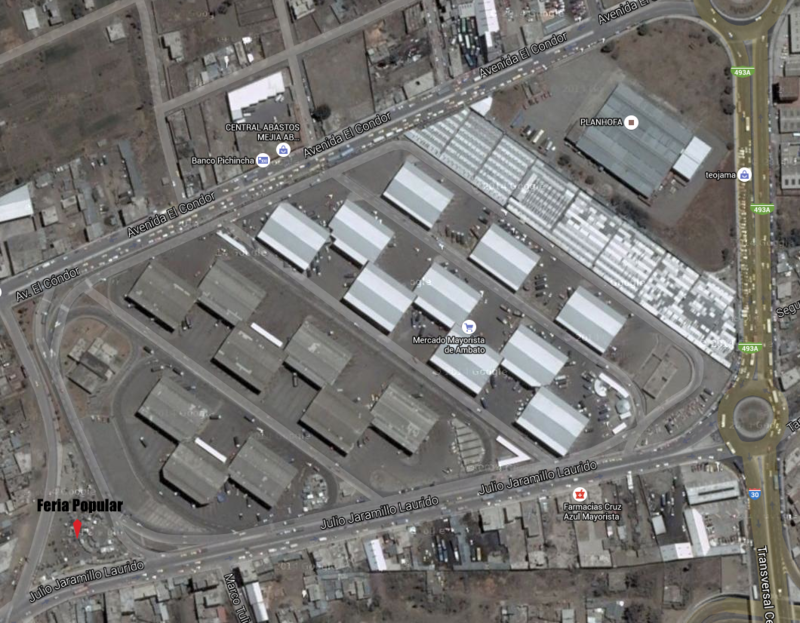 And here's the Mercado Mayorista, as seen from space. What the satellite view doesn't show at all is that the market is built in terraces on a hillside; the top of the hill corresponds to the left-hand side of this image, and it's where we're going to start. 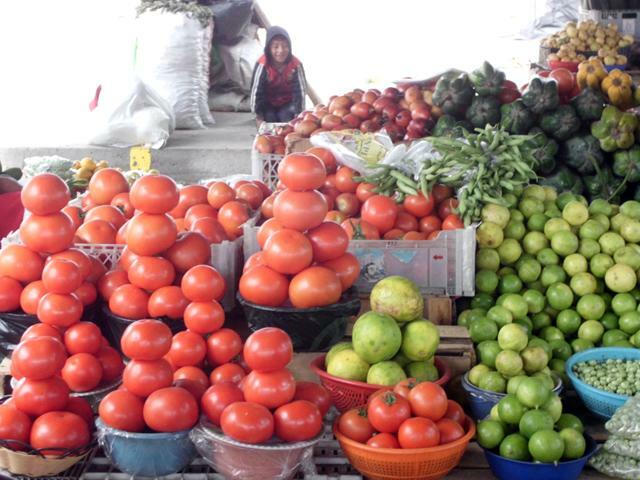 This is the Feria Popular, a collection of smaller stalls that functions as a free-for-all farmer's market on Sunday and Monday, and has established vendors who remain there throughout the week. 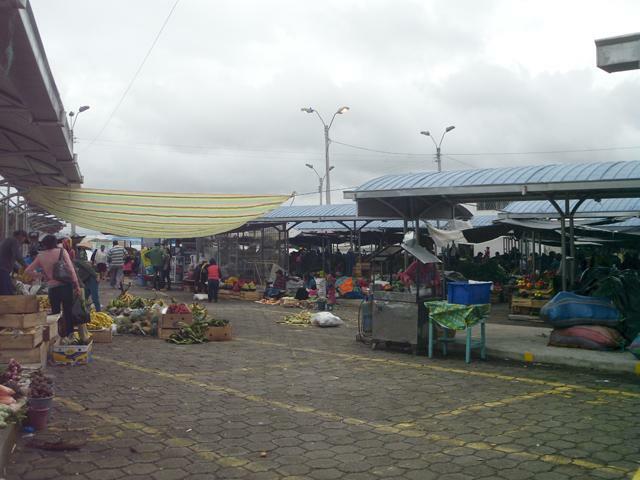 The market, even when it's full to what feels like bursting, generally has a few empty stalls near the side gates. 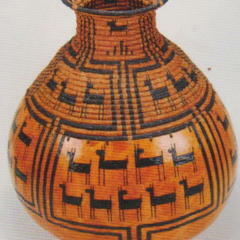 Sellers are an eclectic mix of farmers, farmers' wives, mestizos, indigenous, and others. A tremendous variety of everything is on display and on sale. 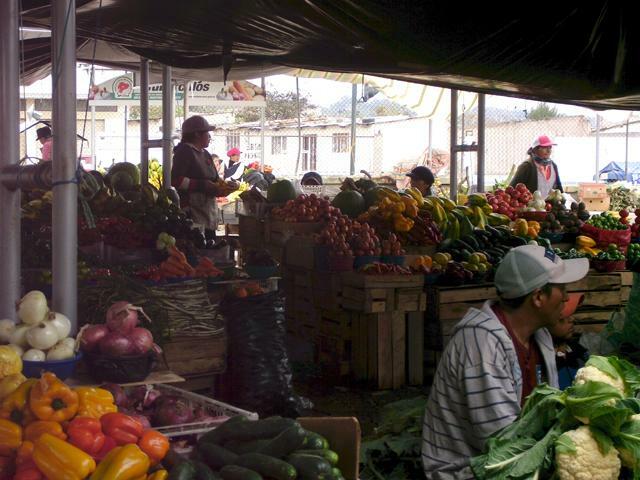 Vendors normally group their produce according to fruit or vegetable, but beyond that it's all piled high. 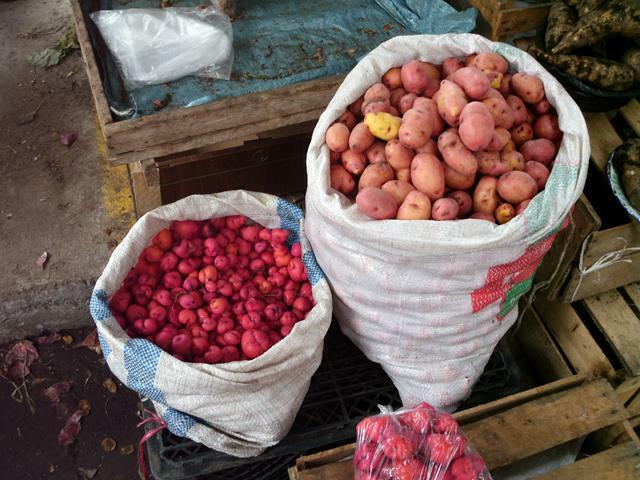 This set of photos shows some of the traditional Andean tubers - Melloco (red), Ullcu (white), Mashua (yellow carroty-looking things), and the more familiar potatoes. It's not quite Oca season yet. The parsnip-looking things in this photo are actually a traditional tuber called Zanahoria Blanca (literally "white carrot" and properly Arracacha, Arracacia xanthorrhiza) - while distantly related to true parsnips, they are wildly different in flavour and texture, much closer to a sweet, slightly crisp potato. 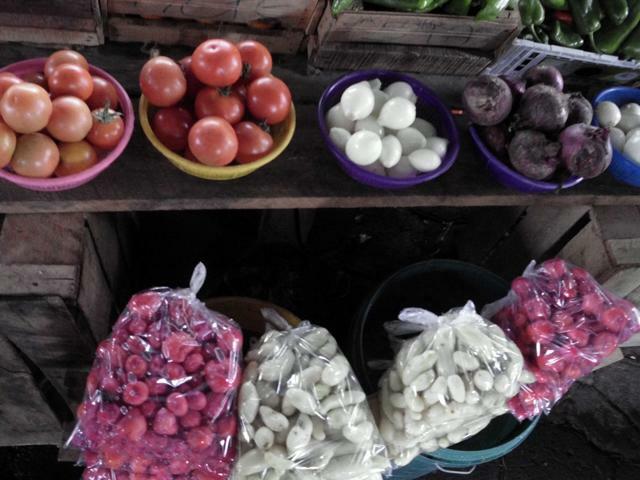 Behind them are Camote, a local variety of purple-hearted sweet potato. A size comparison between Melloco and new potatoes. 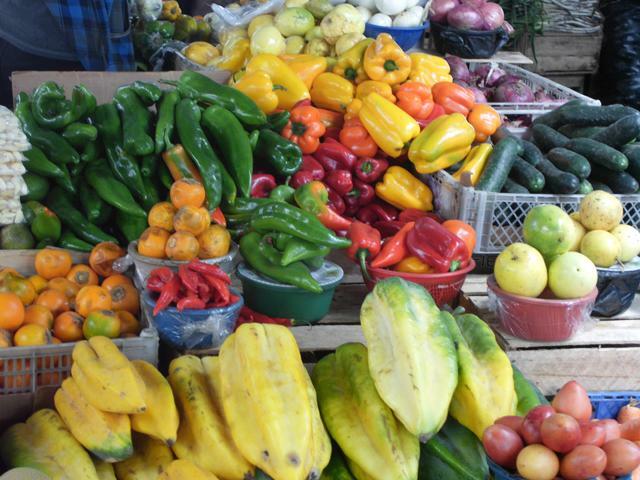 Abundance is the keyword at this market - everything is here, and there's a lot of it. Yes, those are massive white-fleshed pineapples. 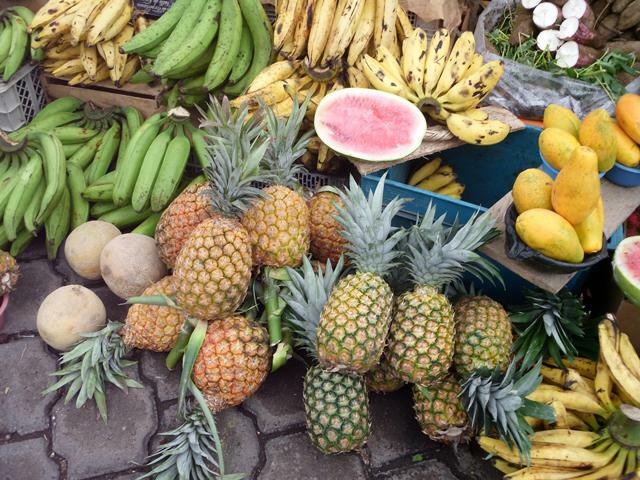 The watermelons in the photo are of fairly average watermelon size, and the pineapples match them. 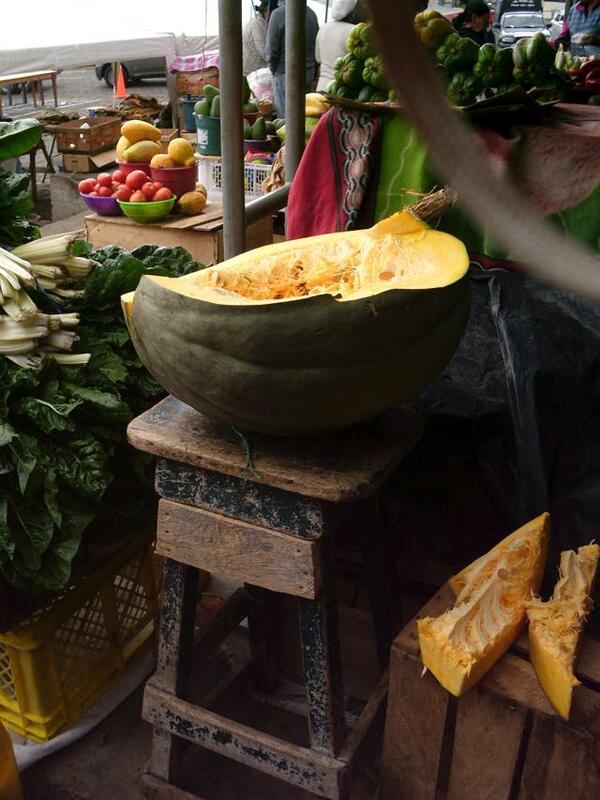 At this point in the year, most things are oversized, and none more so than the squashes. 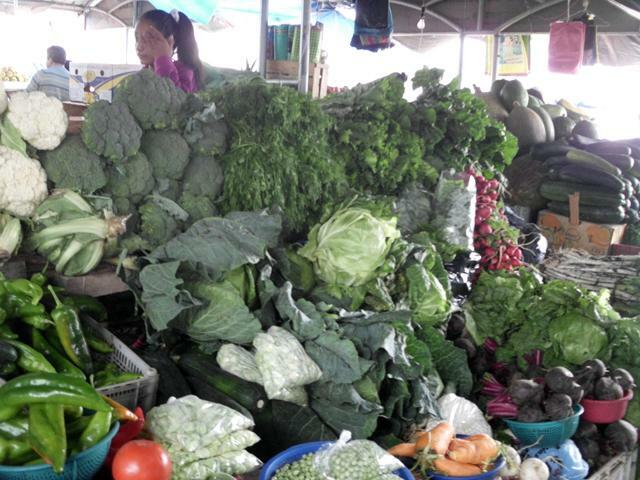 Veggies are also hugely abundant and we enjoy amazing variety.